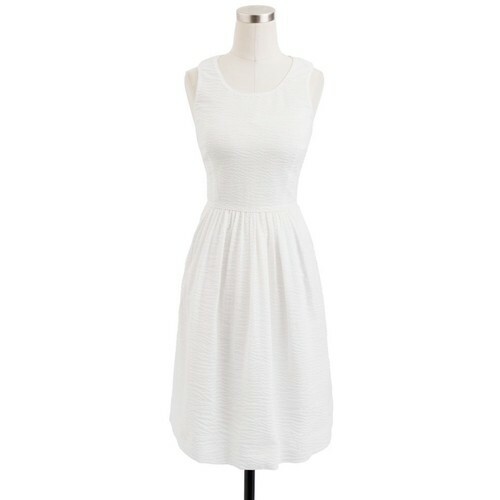 I've been on the hunt for the perfect white summer dress, so when I came across J Crew's Puckered Dress, I thought I'd give it a try. Fresh cotton with a puckered feel lends subtle dimension to a sweet summer dress. Fashioned in a clean and classic silhouette, with a perfectly shirred skirt sure to put some swish in your step. It's the ultimate blank canvas—for bright ballets or a neutral heel—and destined to live in your closet for years. It retails for $128 and comes in periwinkle and fresh kiwi, as well as, white. It's lined, so there's no see-thru issues. It's a good length...I'm 5'5 1/2" and it hits just above my knee. It's tts....I'm wearing a 4 but I would need to size up to a 6 (my normal dress size). It's a little tight in the shoulders and bust. It's a little too voluminous for my taste and a bit too cutesy. I kind of feel like my hair should be in pig-tails and I should be skipping along carrying a big lollipop. That's the best time to find the perfect anything. July always bring summer sales, so take your time. I'm sure you'll find something fabulous. If it's not in time to wear this summer, at least you'll have it for next summer. YES! I have tried this dress on twice. I love the idea of it, though it does something strange to my chest (almost like it flattens it, even if the 00 is large on me). You can't beat the price, but there is a reason why I left the store twice without buying it. I have awarded you the On Lovely Blog Award on my blog in tonight's post. I would like to make a suggestion. Go on the J.Crew website and take a look at the Strapless beach dress in white. It's reminds me of the Lorelei and I believe they have your size available for 49.99. I don't know if the final sale clause scares you, but take a look anyway. Take a look at the Ella Dress in Petal Eyelet. Aww, thank you so much...you're so sweet! I need to get in store and check out some of the great deals and I will check for the bow back dress. My store is smaller so sometimes they don't have all of the inventory, but I will definitely look. If it weren't for the dreaded final sale, I would order it and try it that way...ugg! :o) Thanks for the recommendation!